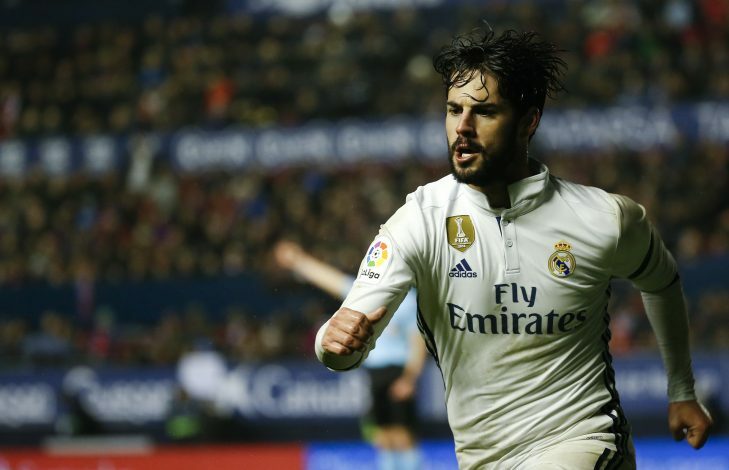 Real Madrid are afraid of losing Isco to arch-rivals FC Barcelona, according to reports in Spain. Isco continues to avoid committing his future to the Santiago Bernabeu outfit, despite being handed a blank check by the board of the club. In fact, the playmaker recently revealed that he will be making a decision regarding his future at the end of this season, on the basis of how much game time he receives in the meanwhile. The Spaniard’s refusal to extend his stay at Real Madrid has reportedly angered club president Florentino Perez, who believes Barcelona – the club Isco has supported since his childhood – are the the ones behind the 24-year-old’s non-cooperative statements and actions, as per Marca. And Perez’s beliefs are only bound to get stronger now, thanks to recent comments from Barcelona defender Jordi Alba. The 27-year-old left-back was recently asked if he would welcome Isco at the Camp Nou, to which he replied (via Goal): “All good players are always welcome. However, Real Madrid boss Zinedine Zidane has absolutely no problem with Isco voicing his concerns about his future, and the French legend has insisted that he continues to trust his play maker. “I think it’s understandable and I have no problem with it,” Zidane told the reporters (via Evening Standard). “You ask him and he replies to those questions. But I’m sure that he’s fully focused. He’s a very good footballer, I regard him highly and he’s player that is part of… squad rotation. A player could play 25-26 games in a row and then not play. You could ask him and I’m sure he’d say he’s not happy.